NIGMS (and other NIH) investigators previously have been able to obtain over 2,500 knockout mouse strains at a negotiated cost from Lexicon. These mouse strains are no longer available directly through Lexicon. You may now request them, along with an additional 1,000 knockout strains, through Taconic. NIH investigators acquiring a Lexicon knockout mouse through Taconic are expected to place the mouse lines in a NIH-supported mouse repository. The NIH Guide notice updates the policy and provides more details. NIH Director Francis Collins recently named Larry Tabak as the NIH principal deputy director. Raynard Kington previously held this key position. Over the years, I have worked closely with Dr. Tabak in many settings, including the Enhancing Peer Review initiative. A biochemist who continues to do research in the field of glycobiology, he is a firm supporter of investigator-initiated research and basic science. He is also a good listener and a creative problem solver. Dr. Tabak, who has both D.D.S. and Ph.D. degrees, has directed NIH’s National Institute of Dental and Craniofacial Research for the past decade. In 2009, Dr. Kington—who had stepped in as acting director of NIH following the departure of Elias Zerhouni—tapped Dr. Tabak to be his acting deputy. Dr. Tabak’s achievements included playing an integral role in NIH Recovery Act activities. Given the challenging issues that the principal deputy director often works on, Dr. Tabak’s experience—from dentist and bench scientist to scientific administrator—clearly provides him with valuable tools for the job. His experience as an endodontist may be particularly useful in some situations, allowing him to identify and “treat” potentially serious issues. Our research programs often produce valuable scientific resources. But if one of these initiatives ends, then what becomes of the resource it generated? To address this issue, we formed a committee of NIGMS staff to explore options for maintaining scientific resources resulting from NIGMS-supported research. We defined a resource as a non-hypothesis-driven activity to provide data, materials, tools or services that are essential to making the most timely, high-quality and cost-efficient progress in a field. We proposed principles for continuing support of “legacy” resources that are of great benefit to researchers working within the Institute’s mission areas. Based on our discussions, we recommended that NIGMS pilot a limited program to fund the maintenance of existing, high-value resources. The NIGMS Council approved the concept in May, and the funding opportunity announcement just appeared in the NIH Guide. Applications are due once per year in October. If you are interested in applying, read the announcement for details, including the special eligibility requirements. And before you apply, be sure to contact the appropriate NIGMS division director to discuss your ideas. We hope that the results of this limited pilot program will help guide future decisions about maintaining important research-generated resources. The program announcement for NIGMS program project grants was published yesterday in the NIH Guide. This grant mechanism enables outstanding scientists working on different aspects of a similar problem to collaborate. Applicants should propose innovative, complementary approaches to solving a significant biological question within the NIGMS mission. Over a 5-year period, program projects may receive total direct costs of up to $6.5 million (excluding any proposed equipment purchases and subcontract indirect costs). If you request more than $500,000 in direct costs in any year, you must receive approval from NIGMS staff before submitting your proposal. I strongly encourage you to speak to the relevant program staff member before submitting a P01 application. For more information, see the NIGMS Program Project Funding Policies Web site. NIH announced this week that the 2-day “error correction window” to fix NIH system-identified errors or warnings after the submission deadline is being eliminated (see NOT-OD-10-123). This change will take effect for submission deadlines on or after January 25, 2011. You will still have up to 2 business days to view the application image and submit a corrected/changed application, as long as you do so before the deadline. The error correction window was instituted by NIH as a temporary measure to facilitate the transition from paper to electronic applications. In light of this change and another related to post-submission materials, it is really important to make sure that you submit an application early (before the submission deadline) so that you and your signing official have an opportunity to address any errors or warnings. NIH’s Applying Electronically Web site includes many helpful resources, such as tips for avoiding common errors. If you’ve got an exceptionally innovative idea that has the potential to jump-start a field, take a look at this year’s EUREKA funding opportunity announcement. Wondering whether EUREKA is appropriate for what you want to do? Check out the Frequently Asked Questions (Link no longer active). If your question isn’t there, ask me! If you do decide to apply, start working on that application right away, because this year’s receipt deadline is October 21, 2010—a month earlier than last year’s deadline. NIGMS has re-announced the Research on Interventions (R01) program that supports research on efforts to increase student interest, motivation and preparedness for careers in biomedical and behavioral research. Proposed research should test assumptions and hypotheses regarding social and behavioral factors that might inform and guide interventions. We are particularly interested in interventions that are specifically designed to increase the number of students from underrepresented groups entering careers in biomedical and behavioral sciences. However, you need not restrict proposed research to students from these groups. In fact, comparative research that analyzes the experience of all groups can help us understand how interventions should be tailored to make more underrepresented students successful in biomedical and behavioral careers. We strongly encourage collaboration among biomedical, behavioral and social science researchers. Currently funded projects are quite varied. Examples include research on interventions at the institutional level and on student characteristics, such as self-efficacy and leadership. Letters of intent are due September 15, 2010, and applications are due October 15, 2010. For additional information about the program, see the funding opportunity announcement or contact me at 301-594-3900 or singhs@nigms.nih.gov. NIGMS recently announced plans to continue participating in the Joint DMS/NIGMS Initiative to Support Research at the Interface of the Biological and Mathematical Sciences. The NSF solicitation includes more information about applying. This joint NSF/NIGMS program started in 2002 to address the pressing need to bring mathematicians into the core of biological research and to encourage broader use of innovative mathematics in understanding life processes. Since then, NIGMS has funded 90 projects involving more than 150 investigators. This year’s awards included nine grants to support mathematics-driven research in biomolecular interactions, signaling and regulatory pathway dynamics, cell proliferation and stress response and branched morphogenesis. Applications for the program are accepted once a year. The 2010 deadline is October 1. A joint NSF/NIGMS panel reviews the applications, and a group of NSF and NIGMS program directors selects ones for funding. The typical funding level for a 4-year grant is between $1.2 million and $1.6 million (total costs for all years). In April of this year, NSF and NIGMS sponsored the Frontiers in Mathematical Biology meeting, which brought together scientists supported by the program. See my May 5 post for more about this meeting. The August issue of NIH’s Extramural Nexus includes two announcements that might interest you. Starting with September grant application reviews, reviewers will include a summary paragraph to explain what factors they considered in assigning the overall impact score. This should help investigators better understand the reasons for the score. The director’s column talks about the importance of communicating research value in your grant application. Your grant title, abstract and statement of public health relevance are very important. Once a grant is funded, these items are available to the public through NIH’s RePORTER database. Many people are interested in learning about research supported with taxpayer dollars, so I encourage you to be clear and accurate in writing these parts of your application. Reviewers are being told to expect plain language in these sections. I recently posted several analyses (on July 15, July 19 and July 21) of the relationships between the overall impact scores on R01 applications determined by study sections and the criterion scores assigned by individual reviewers. These analyses were based on a sample of NIGMS applications reviewed during the October 2009 Council round. This was the first batch of applications for which criterion scores were used. NIGMS applications for the October 2010 Council round have now been reviewed. Here I present my initial analyses of this data set, which consists of 654 R01 applications that were discussed, scored and percentiled. The first analysis, shown below, relates to the correlation coefficients between the overall impact score and the averaged individual criterion scores. Correlation coefficients between the overall impact score and averaged individual criterion scores for 654 NIGMS R01 applications reviewed during the October 2010 Council round. The corresponding scores for a sample of 360 NIGMS R01 applications reviewed during the October 2009 Council round are shown in parentheses. Overall, the trend in correlation coefficients is similar to that observed for the sample from 1 year ago, although the correlation coefficients for the current sample are slightly higher for four out of the five criterion scores. Principal component analysis of overall impact score based on the five criterion scores for 654 NIGMS R01 applications reviewed during the October 2010 Council round. The corresponding scores for a sample of 360 NIGMS R01 applications reviewed during the October 2009 Council round are shown in parentheses. There is remarkable agreement between the results of the principal component analysis for the October 2010 data set and those for the October 2009 data set. The first principal component accounts for 72% of the variance, with the largest contribution coming from approach, followed by innovation, significance, investigator and finally environment. This agreement between the data sets extends through all five principal components, although there is somewhat more variation for principal components 2 and 3 than for the others. Another important factor in making funding decisions is the percentile assigned to a given application. The percentile is a ranking that shows the relative position of each application’s score among all scores assigned by a study section at its last three meetings. Percentiles provide a way to compare applications reviewed by different study sections that may have different scoring behaviors. They also correct for “grade inflation” or “score creep” in the event that study sections assign better scores over time. 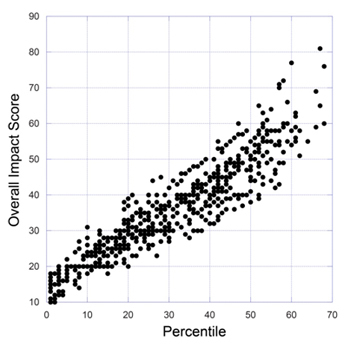 A plot of the overall impact score versus the percentile for 654 NIGMS R01 applications reviewed during the October 2010 Council round. This plot reveals that a substantial range of overall impact scores can be assigned to a given percentile score. This phenomenon is not new; a comparable level of variation among study sections was seen in the previous scoring system, as well. Correlation coefficients between the percentile and the averaged individual criterion scores for 654 NIGMS R01 applications reviewed during the October 2010 Council round. As one would anticipate, these correlation coefficients are somewhat lower than those for the overall impact score since the percentile takes other factors into account. Principal component analysis of percentile data based on the five criterion scores for 654 NIGMS R01 applications reviewed during the October 2010 Council round. The results of this analysis are very similar to those for the overall impact scores, with the first principal component accounting for 72% of the variance and similar weights for the individual averaged criterion scores. Our posting of these scoring analyses has led the NIH Office of Extramural Activities and individual institutes to launch their own analyses. I will share their results as they become available.